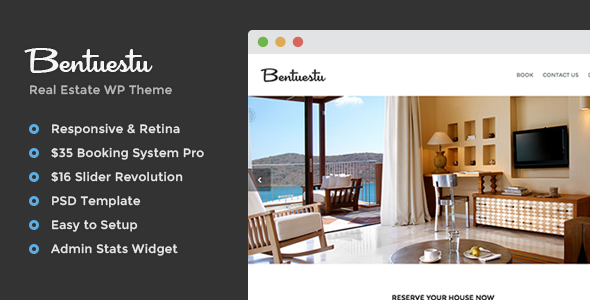 Bentuestu is a Responsive Real Estate WordPress Theme is the fastest and easiest solution to Rent Property online. This template is perfect for anyone renting out an apartment or house, for Bed and Breakfast (Guest House), Campsites, for serve as corporate website for small hotels or as a traffic funnel for sites like airbnb. Based on bootstrap grid, Bentuestu is fully responsive, fast to set up and it’s created by using the latest HTML5 and CSS3 techniques. The theme has a working booking form with an integrated availability calendar. It includes a bunch of shortcodes to give you total freedom when managing your property. Item Reviewed: Bentuestu Responsive Real Estate WordPress Theme 9 out of 10 based on 10 ratings. 9 user reviews.